Here's solution of how to free download 2018 (44th) Philippines Metro Manila Film Festival videos in (1080P) HD MP4, such as awards night full show, award-winning/nominted movies, parade of floats and so on. During Christmas season (from December 25, 2018 to January 7, 2019), the 44rd Metro Manila Film Festival (MMFF) is held in Metro Manila, Philippines to show locally produced films in theaters. Floats on behalf of movie entries respectively, will parade down Roxas Boulevard, the most popular waterfront promenade in Manila at the opening of MMFF to celebrate this grand annual film festival. For someone who unfortunately loses the chance to watch live, this article will introduce an easy to to free download Metro Manila Film Festival videos (HD MP4) for offline enjoy awards night full show, parade of floats and MMFF movies on PC/devices whenever and wherever. How Can We Download MMFF 2018 (Full Show) Videos in HD MP4 for FREE? Various online video-sharing sites will never disappoint you when you want to access MMFF videos, e.g. 2018 MMFF awards night full show, winners/nominations, parade of floats etc. 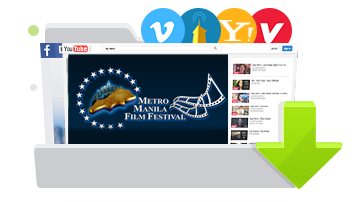 It is a good idea to free download MMFF HD videos from YouTube, Dailymotion, Vimeo, Metacafe and more for playback on PC/Mac without ads and unexpected interruption caused by poor network. WinX YouTube Downloader is an user-friendly tool available to free download any SD/(1080P) HD/4K UHD videos in diverse formats (MP4, FLV, WebM, 3GP etc.) from 600+ video-sharing sites speedily. It is 100% clean and safe to make sure that no spyware/malware will be installed stealthily or virus will be infected with your computer. Step 1. Click "Add Url" icon on navigation bar or button put on the center of main interface of WinX YouTube Downloader. Step 2. Search MMFF related videos on YouTube or other sites. Copy and paste YouTube URL to address bar. Step 3. Click "Analyze" button. The list of outputs varying from quality, format, frame rate and size is shown. Select one and click "Download Selected Videos". Tip: if you would like to batch download videos related to MMFF (like trailers of winners/entries), repeat step 1.2.3 to add the video source into download list before step 4. Step 4. If necessary, click "Browse" button to define a new output folder. Next, click "Download Now" to start downloading. Want to play MMFF videos on latest devices featuring large screen and improved resolution? WinX HD Video Converter Deluxe, a versatile video downloader and converter, allows you to free download Metro Manila Film Festival videos from YouTube, Dailymotion, Vimeo, Metacafe etc, and convert them to AVI, WMV, MPEG, MOV, iPhone, iPad, Samsung Galaxy, Google Nexus, Windows Phone, Surface Pro/Book etc, retaining high video/audio quality. Also, it is capable of directly converting HD/4K/8K movies/videos (MKV, MTS, AVCHD, MOD, TOD etc.) to MP4, AVI, MOV, Apple/Android devices at a very high speed. Please feel free to share this tutorial if you think it is helpful!